A general method is presented to calculate absolute binding energies of core levels in metals and insulators, based on a penalty functional and an exact Coulomb cutoff method in a framework of the density functional theory. The spurious interaction of core holes between supercells is avoided by the exact Coulomb cutoff method, while the variational penalty functional enables us to treat multiple splittings due to chemical shift, spin-orbit coupling, and exchange interaction on equal footing, both of which are not accessible by previous methods. It is demonstrated that the absolute binding energies of core levels for both metals and insulators are calculated by the proposed method in a mean absolute (relative) error of 0.4 eV (0.16 %) for eight cases compared to experimental values measured with X-ray photoemission spectroscopy within a generalized gradient approximation to the exchange-correlation functional. Since the pioneering works by Siegbahn et al. [1,2], the X-ray photoelectron spectroscopy (XPS) has become one of the most important and widely used techniques in studying chemical composition and electronic states in the vicinity of surfaces of materials . Modern advances combined with synchrotron radiation further extend its usefulness to enable a wide variety of analyses such as core level vibrational fine structure , magnetic circular dichroism (MCD) , spin-resolved XPS , and photoelectron holography . The basic physics behind the still advancing XPS measurements is dated back to the first interpretation for the photoelectric effect by Einstein . An incident X-ray photon excites a core electron in a bulk, and the excited electron with a kinetic energy is emitted from the surface to vacuum. The binding energy of the core level in the bulk can be obtained by measuring the kinetic energy [1,2]. Theoretically, the calculation of the binding energy involving evaluation of the total energies for the initial and final states is still a challenging issue especially for insulators, since after the emission of the photoelectron the system is not periodic anymore and ionized due to the creation of the core hole. The violation of the periodicity hampers use of conventional electronic structure methods under a periodic boundary condition, and the Coulomb potential of the ionized bulk cannot be treated under an assumption of the periodicity due to the Coulombic divergence. One way to avoid the Coulombic divergence is to neutralize the final state with a core hole by adding an excess electron into conduction bands [9,10,11,12,13] or to approximate the bulk by a cluster model . However, the charge compensation may not occur in insulators because of the short escape time of photoelectron ( sec.) , while the treatment might be justified for metals. Even if we employ the charge compensation scheme, the screened core hole pseudopotential which has been widely used in pseudopotential methods allows us to calculate only the chemical shift of binding energies, but not the absolute values . In spite of the long history of XPS and its importance in materials science, a general method has not been developed so far to calculate the absolute binding energies for both insulators and metals, including multiple splittings due to chemical shift, spin-orbit coupling, and exchange interaction, on equal footing . 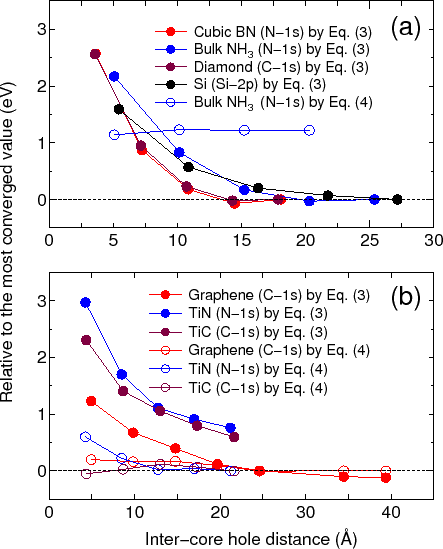 In this Letter we propose a general method to calculate absolute binding energies of core levels in metals and insulators, allowing treatment of all the issues mentioned above and the direct comparison to experimental results, in a single framework within the density functional theory (DFT) [19,20]. Let us start to define the absolute binding energy of core electrons in bulks measured by a XPS experiment, based on the energy conservation. The energy of the initial state is given by the sum of the total energy of the ground state of electrons and an energy of a monochromatic X-ray photon. 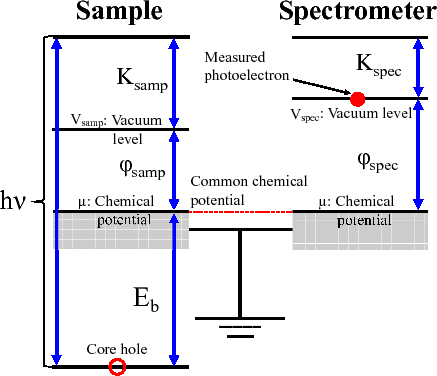 Figure 1: Schematic energy diagram for a sample and a spectrometer in the XPS measurement. which allows us to employ the total energy of the neutralized final state instead of that of the ionized state. For metals, Eqs. (3) and (4) should result in an equivalent binding energy in principle, however, the convergence is different from each other as a function of the system size as shown later on. where is the kinetic operator, and the conventional KS effective potential originated from . If a large number, 100 Ryd. was used in this study, is assigned for in Eq. (7), the targeted core state specified by the quantum numbers and is penalized through the projector in Eq. (10), and becomes unoccupied, resulting in the creation of a core hole for the targeted state. 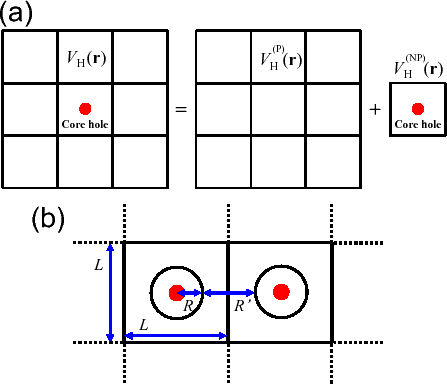 Since the creation of the core hole is self-consistently performed, the screening effects by both core and valence electrons, spin-orbit coupling, and exchange interaction are naturally taken into account in a single framework. It is also straightforward to reduce the projector to the non-relativistic treatment. where is the discrete Fourier transform of , and is given by , which is the Fourier transform of a cutoff Coulomb potential with the cutoff radius of . Figure 2: (a) Treatment of the Hartree potential in a system with a core hole under the periodic boundary condition. (b) Configuration to calculate the non-periodic part of the Hartree potential by the exact Coulomb cutoff method for . If is localized within a sphere of a radius as shown in Fig. 2(b), the extent of the Coulomb interaction is at most in the sphere, which leads to . In addition, a condition should be satisfied to avoid the spurious interaction between the core holes. In practice, we set , and investigate the convergence of the binding energy as a function of . With the treatment the core hole is electrostatically isolated from the other periodic images of the core hole even under the periodic boundary condition. The proposed method has been implemented in a DFT software package OpenMX , which is based on norm-conserving relativistic pseudopotentials [26,27] and pseudo-atomic basis functions . The pseudopotentials were generated including the -state for a carbon, nitrogen, and oxygen atom, and up to the -states for a silicon atom [26,27], respectively, by solving the spherical Dirac equation. In the pseudopotential generation, the occupation of the state for which a core hole is created in the final state calculations is reduced by 0.5, and the remaining occupation is added to that of the valence states. The pseudopotentials were commonly used in the calculations for the initial and final states. The treatment for the occupation in generating the pseudopotentials might be a non-biased way in applying pseudopotentials for the initial and final states on equal footing. The Kohn-Sham wave functions are expressed by a two-component spinor, and the spatial part is expanded by a linear combination of pseudo-atomic orbitals (PAOs). As basis functions of PAOs variationally optimized double valence plus single polarization orbitals (DVSP) and triple valence plus double polarization orbitals (TVDP) were used for bulks and gaseous molecules, respectively, after careful benchmark calculations for the convergence [28,41]. The spin-orbit coupling was taken into account self-consistently through the j-dependent relativistic pseudopotentials [26,27]. Neither a frozen core approximation nor any restriction for spin polarization were introduced for the core state for which a core hole is created in the final state calculations. A generalized gradient approximation (GGA)  to the exchange-correlation functional was used. It was assumed that electrons populate the Kohn-Sham eigenstates according to the Fermi distribution at a finite temperature, resulting the self-consistent determination of the chemical potential depending on the band gap and shape of density of states. For all the calculations in the study we used an electronic temperature of 300 K. In all the cases we used the chemical potential calculated for the initial state without a core hole for Eq. (3). The real space grid techniques were used with the energy cutoff of 350 Ry in numerical integrations and the solution of Poisson equation using FFT . Figures 3(a) and (b) show relative binding energies of core levels in gapped systems and metals including a semimetal (graphene), respectively, as a function of inter-core hole distance, where all the molecular and crystal structures used in the study were taken from experimental ones. For the gapped systems the convergent results are obtained at the inter-core hole distance of 15, 20, and 27 Å for cubic boron nitride (diamond), bulk NH , and silicon, respectively. Figure 3: Calculated binding energies, relative to the most converged value, of (a) gapped systems and (b) a semimetal (graphene) and metals as a function of inter-core hole distance. The reference binding energies in (a) and (b) were calculated by Eqs. (3) and (4), respectively, for the largest unit cell for each system. This implies that the difference charge induced by the creation of the core hole is localized within a sphere with a radius of , e.g., 7 Å for silicon. In fact, the localization of in silicon can be confirmed by the distribution in real space and the radial distribution of a spherically averaged as shown in Figs. 4(a) and (b). The deficiency of electron around 0.3 Å corresponding to the core hole in the -states is compensated by increase of electron density around 1 Å, which is the screening on the same silicon atom for the core hole. As a result of the short range screening, the non-periodic Hartree potential deviates largely from as shown in Fig. 4(c). In Fig. 3(a) it is also shown that the binding energy of the bulk NH calculated with Eq. (4) converges at 1.2 eV above, implying that Eq. (4) cannot be applied to gapped systems. Table 1: Calculated binding energy of a core level in bulks. On the other hand, for the metallic cases we see that Eq. (4) provides a much faster convergence than Eq. (3), and both Eqs. (3) and (4) seem to give a practically equivalent binding energy, while the results calculated with Eq. (3) for TiN and TiC do not reach to the sufficient convergence due to computational limitation . Therefore, Eq. (4) is considered to be the choice for the practical calculation of a metallic system because of the faster convergence. By compiling the size of the unit cell achieving the convergence into the number of atoms in the unit cell, the use of a supercell including 500 and 64 atoms for gapped and metallic systems in three-dimensions might be a practical guideline for achieving a sufficient convergence by using Eqs. (3) and (4), respectively. The calculated values of binding energies are well compared with the experimental absolute values as shown in Table I for both the gapped and metallic systems, and the mean absolute (relative) error is found to be 0.4 eV (0.16 %) for the eight cases. We see that the splitting due to spin-orbit coupling in the silicon -states is well reproduced. In addition, binding energies of a core level for gaseous molecules are shown in the supplemental material, where the mean absolute (relative) error is found to be 0.5 eV (0.22 %) for the 23 cases. Figure 4: (a) Difference charge density in silicon, induced by the creation of a core hole in the -states, where the unit cell contains 1000 atoms, and the inter-core hole distance is 27.15 Å. (b) Radial distribution of , where is a spherically averaged . (c) Radial distribution of being a spherically averaged . In summary, we proposed a general method to calculate absolute binding energies of core levels in metals and insulators in a framework of DFT. The method is based on a penalty functional and an exact Coulomb cutoff method. 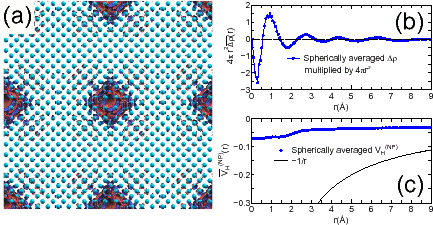 The former allows us to calculate multiple splittings due to chemical shift, spin-orbit coupling, and exchange interaction, while the latter enables us to treat a charged system with a core hole under the periodic boundary condition. It was also shown that especially for metals Eq. (4) involving the neutralized final state is equivalent to Eq. (3) involving the ionized final state, and that Eq. (4) is computationally more efficient than Eq. (3). The remarkable agreement with the absolute binding energies measured in XPS demonstrates the validity of the proposed method for a variety of materials. For a better description of a case where an exchange interaction plays a dominant role in the splitting, a good approximation to the exchange-correlation functional should be adopted and our method provides a natural way to examine the resulting total energies, while a possible error by the pseudopotentials and the dependency of chemical potential on surface structures should also be addressed in future work. Considering the importance of the XPS measurement in materials researches, the proposed method is anticipated to play an indispensable role in quantitatively analyzing absolute binding energies of core levels in solids. We would like to thank Y. Yamada-Takamura and J. Yoshinobu for helpful discussions on the XPS measurements. This work was supported by Priority Issue (Creation of new functional devices and high-performance materials to support next-generation industries) to be tackled by using Post 'K' Computer, MEXT, Japan. K. Siegbahn, C. Nordling, A. Fahlman, K. Hamrin, J. Hedman, R. Nordberg, C. Johansson, T. Bergmark, S.-E. Karlsson, I. Lindgren, and B. Lindberg, Atomic, molecular and solid-state structure studied by means of electron spectroscopy, Nova Acta Regiae Soc. Sci. Ups. 20.1-282, Almqvist and Wiksells (1967). K. Siegbahn, C. Nordling, G. Johansson, J. Hedman, P.-F. Heden, K. Hamrin, U. Gelius, T. Bergmark, L.O. Werme, R. Manne, and Y. Baer, ESCA Applied to Free Molecules, North-Holland, Amsterdam, The Netherlands (1969). C.S. Fadley, J. Electron Spectrosc. Relat. Phenom. 178-179, 2 (2010). U. Hergenhahn, J. Phys. B: Atom. Mol. Opt. Phys. 37, R89 (2004). S.-H. Yang, B.S. Mun, N. Mannella, S.-K. Kim, J.B. Kortright, J. Underwood, F. Salmassi, E. Arenholz, A. Young, Z. Hussain, M.A. Van Hove, and C.S. Fadley, J. Phys. Condens. Matter 14, L406 (2002). H.-J. Kim, E. Vescovo, S. Heinze, and S. Blügel, Surf. Sci. 478, 193 (2001). S. Omori, Y. Nihei, E. Rotenberg, J.D. Denlinger, S. Marchesini, S.D. Kevan, B.P. Tonner, M.A. Van Hove, and C.S. Fadley, Phys. Rev. Lett. 88, 055504 (2002). A. Einstein, Ann. Phys. 17, 132 (1905). E. Pehlke and M. Scheffler, Phys. Rev. Lett. 71, 2338 (1993). T. Susi, D.J. Mowbray, M.P. Ljungberg, and P. Ayala, Phys. Rev. B 91 081401(R) (2015). W. Olovsson, T. Marten, E. Holmström, B. Johanssone, and I.A. Abrikosov, J. Electron Spectrosc. Relat. Phenom. 178-179, 88 (2010). M.P. Ljungberg, J.J. Mortensen, L.G.M. Pettersson, J. Electron Spectrosc. Relat. Phenom. 184, 427 (2011). S. García-Gil, A. García, and P. Ordejón, Eur. Phys. J. B 85, 239 (2012). P.S. Bagus, E.S. Ilton, and C.J. Nelin, Surf. Sci. Reports 68, 273 (2013). A.L. Cavalieri, N.Mülle, Th. Uphue, V S. Yakovle, A. Baltuˇk, B. Horvat, B. Schmid, L. Bümel, R. Holzwarth, S. Hendel, M. Drescher, U. Kleineberg, P.M. Echenique, R. Kienberger, F. Krausz, and U. Heinzmann, Nature 449, 1029 (2007). An empirical offset approach has been proposed to calculate absolute binding energies of core levels in gapped systems . Also, note that a perturbation theory can be used to include spin-orbit coupling within the initial state theory . M. Walter, M. Moseler, and L. Pastewka, Phys. Rev. B 94, 041112(R) (2016). X. Blase, A.J.R. daSilva, X. Zhu, and S.G. Louie, Phys. Rev. B 50, 8102(R) (1994). This is the case that the charging of the sample is carefully compensated, and the recoil energy is ignored . J.F. Watts, Vacuum 45, 653 (1994). J.F. Janak, Phys. Rev. B 18, 7165 (1978). M.R. Jarvis, I.D. White, R.W. Godby, and M.C. Payne, Phys. Rev. B 56, 14972 (1997). The OpenMX code is available on a web site (http://www.openmx-square.org/). G. Theurich and N.A. Hill, Phys. Rev. B 64, 073106 (2001). I. Morrison, D.M. Bylander, L. Kleinman, Phys. Rev. B 47, 6728 (1993). T. Ozaki, Phys. Rev. B. 67, 155108, (2003). C.D. Wagner, W.M. Riggs, L.E. Davis, J.F. Monider, G.E. Mullenberg, "Handbook of X-ray photoelectron spectroscopy", Perkin-Elmer (1979). F.P. Larkins and A. Lubenfeld, J. Electron Spectrosc. Relat. Phenom. 15, 137 (1979). X.B. Yan, T. Xu, S.R. Yang, H.W. Liu, and Q.J. Xue, J. Phys. D: Appl. Phys. 37, 2416 (2004). D. Jaeger and J. Patscheider, Surf. Sci. Spectra 20, 1 (2013). We further verified the equivalence between Eqs. (3) and (4) by calculating the -state of a carbon atom in a model metal of an infinite carbon chain, and found that the difference is 0.07 eV at the inter-core hole distance of 225 Å. However, the convergence with Eq. (3) is again found to be very slow. A.A. Bakke, A.W. Chen, and W.L. Jolly, J. Electron Spectrosc. Relat. Phenom. 20, 333 (1980). W.L. Jolly, K.D. Bomben, C.J. Eyermann, At. Data Nul. Data Tables 31, 433 (1984). Y. Morioka, M. Nakamura, E. Ishiguro, and M. Sasanuma, J. Chem. Phys. 61, 1426 (1974). G.R. Wight and C.E. Brion, J. Electron Spectrosc. Relat. Phenom. 4, 313 (1974). P.S. Bagus and H.F. Schaefer III, J. Chem. Phys. 55, 1474 (1971). K. Lejaeghere et al., Science 351, aad3000 (2016). T. Ozaki and H. Kino, Phys. Rev. B 72, 045121 (2005).